Collections are a great tool to tame your growing library. The more articles you have, the more likely it is you would want to group your articles based on topic or based on the different projects they relate to. Whatever your criteria for grouping articles, collections will help you along the way. Articles can be added to one or more collections. 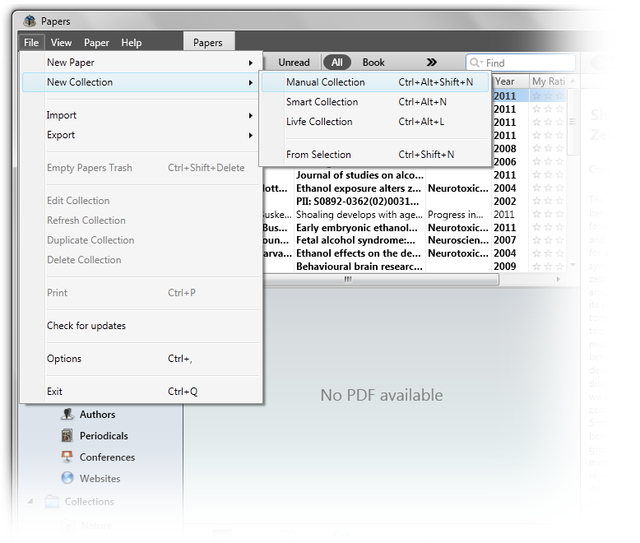 Collections are a bit like creating different folders on your computer, and adding articles to them, except smarter. Collections do not put a drain on hard drive space, because the actual files are not duplicated regardless of how many collections you add the same article to. Manual Collections: These are regular 'plain' collections you create when selecting "New Collection". Add articles to these collections by dragging and dropping them from your library into the collection. Collection from Selection: This creates a collection that includes all articles you have selected from your library. Smart Collections: Smart collections are created based on parameters you select. Articles currently in your library are added to smart collections automatically, and any new articles you import will be added automatically as well if they meet the parameters. 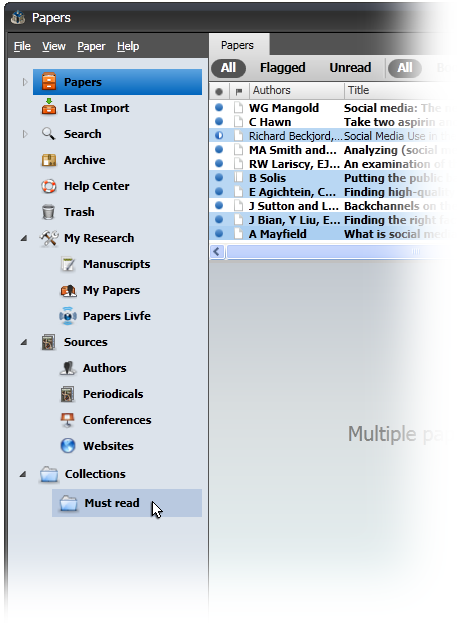 Livfe Collections: Collections can be shared with other Papers users using Papers Livfe. You can choose to make your Livfe collection available to all Papers users, or you can keep the collection private and share it only by invitation with colleagues and peers. Smart collections filters articles into a collection based on some parameters you set. For example, you can create a smart collection based on a set of keywords, or by publisher. Whenever you add a new article to your library that meets the parameters, your new article is added to the smart collection. Papers makes it easy for you to create smart collections of your documents. In this tutorial, we will show you how to create a smart collection by creating one based on some of the different parameters you can use. 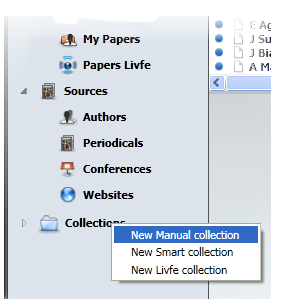 In this example we will create a smart collection for papers published by Nature. Click on New Smart Collection from the drop down menu you see after right-clicking on "Collections" in the source list.